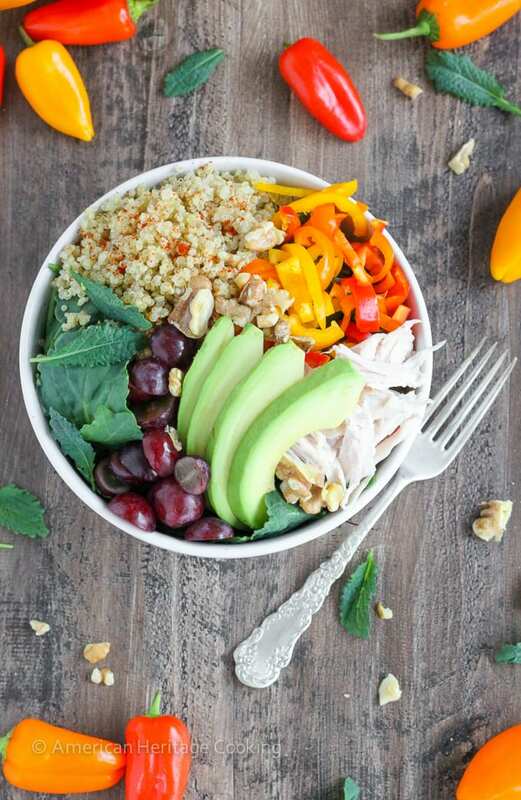 This Quinoa Kale Power Bowl is packed with vitamins, minerals, healthy fats and filling protein! Oh hey! Culinary school has taken over my life the past few weeks, but I’ll fill you in on that at another time. Today, today is about food!!! More specifically filling, healthy food! Even I cannot live on bread alone. Yes, I can. But it’s best if I don’t! You know the ubiquitous Power Bowl that has popped up at every food establishment? The one that has a sprinkle of quinoa, a few leaves of kale and a whole lot of filler; and yet somehow they still justify charging $15 for it? The first week of school I traded some fudge brownies for one such salad (Best trade ever, by the way!) and I decided for free it was awesome but for $15 I could do so much better! This is my version. 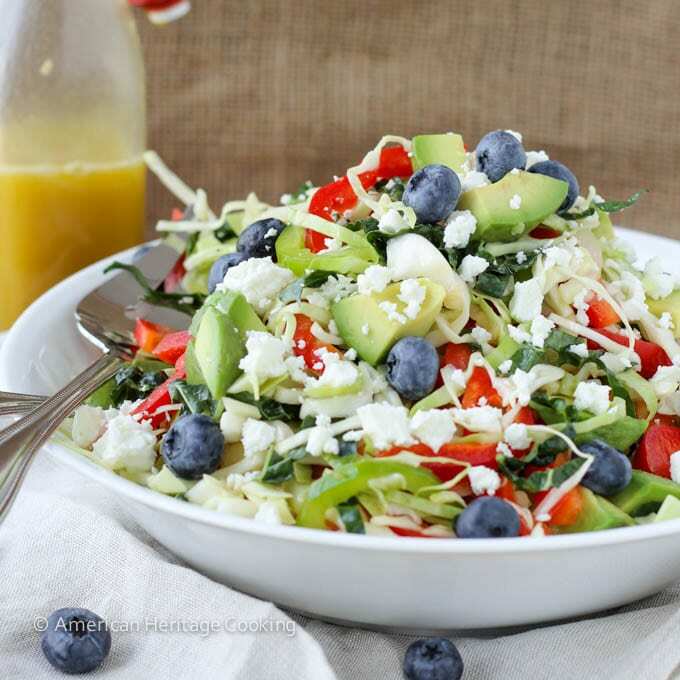 It’s packed full of healthy, fresh vegetables, filling protein and just a hint of sweet from the grapes. It’s just how I do. 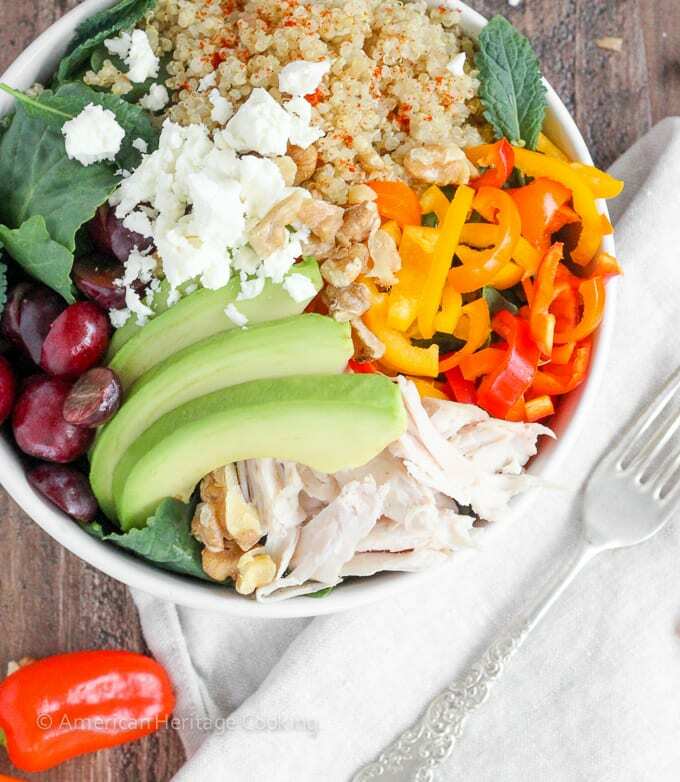 Triple protein from the quinoa, turkey and feta; healthy and filling fat from the avocado; and vitamins and minerals from the kale, peppers and grapes! It is seriously packed to the max with healthful fresh ingredients. 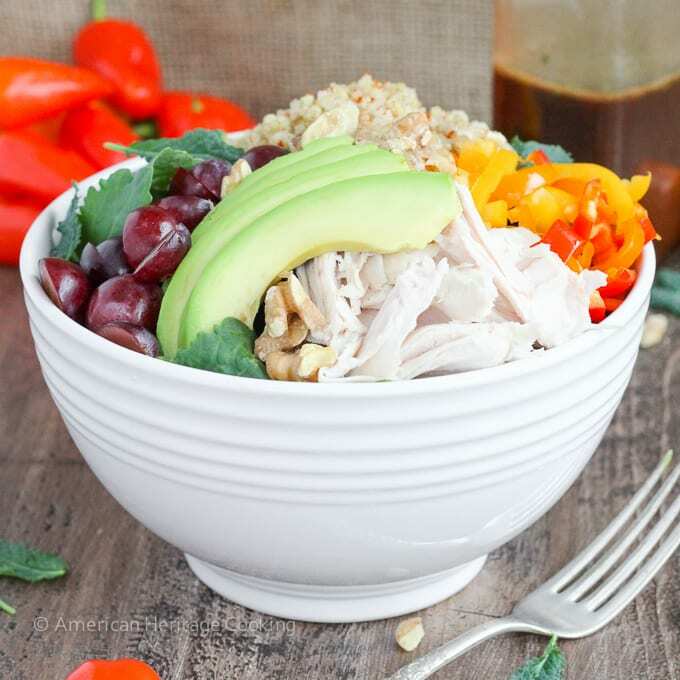 I love to warm up the quinoa and turkey before assembling the bowl but it tastes delicious cold packed for lunch too. I should know; I ate it everyday for over a month! But seriously, how could you not want to dig right into a salad that looks like that? And when you are exhausted and starving and trying to cram both eating and resting into your 30 minute lunch break, color is everything. 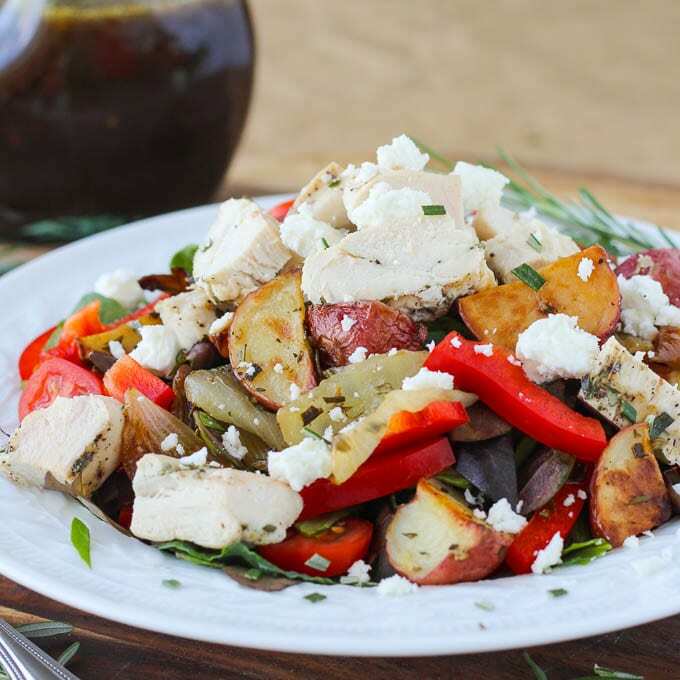 Drizzle it with a low-fat rosemary thyme balsamic vinaigrette, and you have yourself a filling meal that will power you through lunch, the afternoon crash, your workout and beyond. This is also quite possibly the easiest lunch or dinner ever. I’ve been making it with rotisserie chicken or turkey breast that I pick up on my way home from the gym. Whatevs. Something has to give. If you have 10 minutes and some spare chicken breasts, I suggest my ridiculously easy, foolproof Rosemary Chicken Breasts. They are so easy it’s actually embarrassing that I ever buy rotisserie chicken. 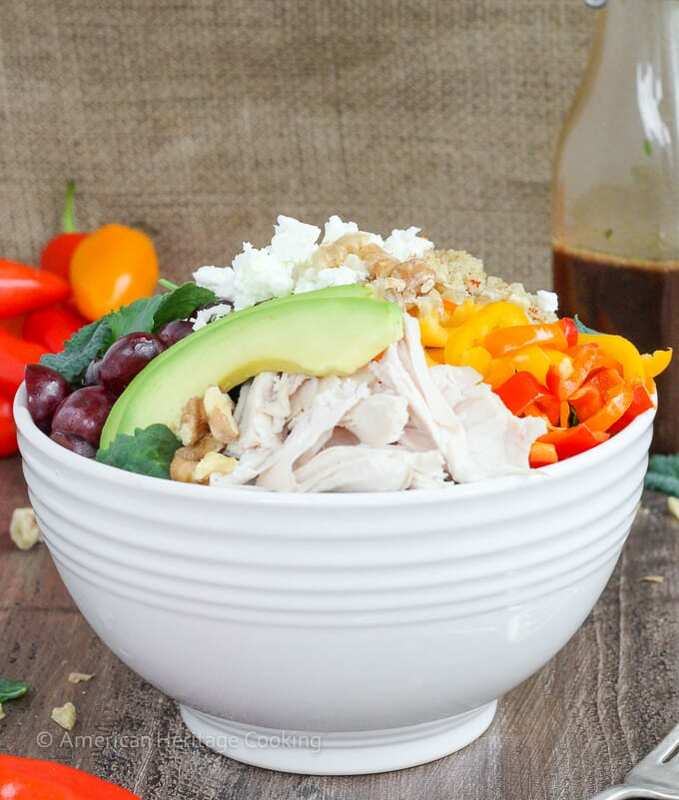 Half the time I omit the turkey or chicken and add an extra ¼ avocado and a sprinkle of toasted walnuts to make an equally filling and vegetarian salad. 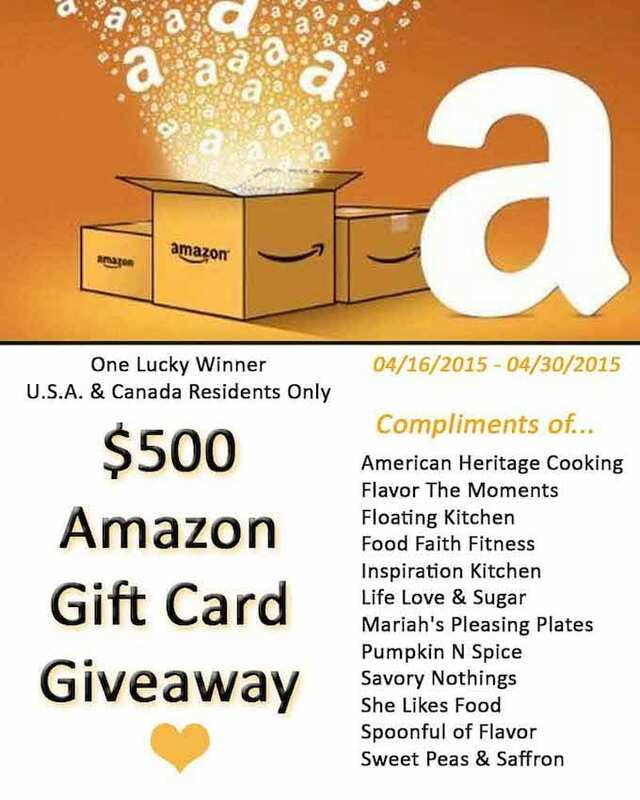 And as if a salad isn’t enough to fill you up, I’ve joined with a bunch of my favorite bloggers to bring you a $500 Amazon gift card giveaway!!! Each like or follow counts as one entry below! 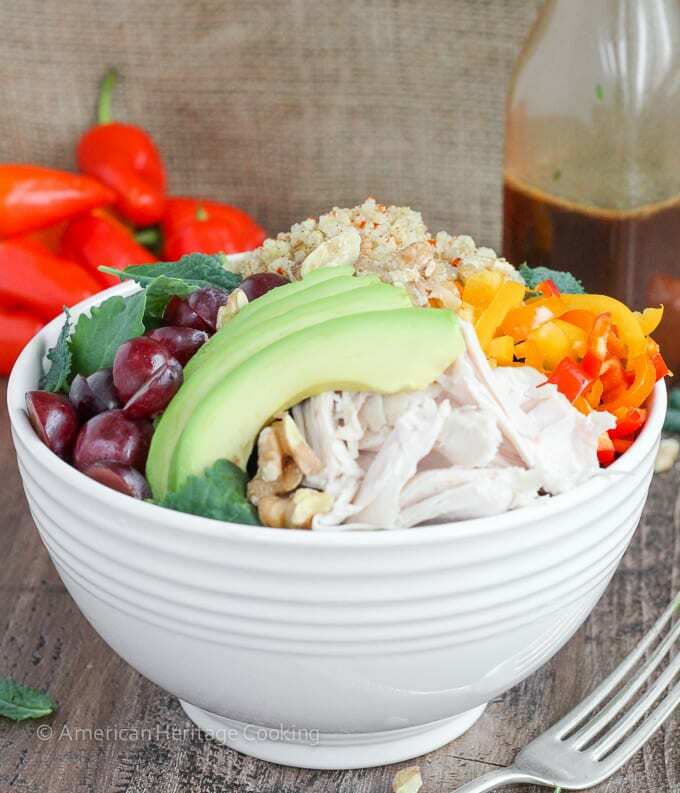 This Quinoa Kale Power Bowl is packed with vitamins, minerals, healthy fats and filling protein! Plus it is a super easy recipe that is perfect for lunch or dinner! I cook a huge batch of quinoa at the beginning of the week but I use a 2:1 ratio of water to quinoa, so for every 1 cup of quinoa, I use 2 cups of water. Rinse your quinoa, add to a pot with the water, several tablespoons of olive oil and several pinches of salt. Bring to a boil over medium heat, cover and reduce the heat to low; simmer on low for 10-15 minutes or until the quinoa has absorbed all the water and is tender. Combine everything in a bowl. Sprinkle quinoa and turkey with paprika and a pinch of salt. Combine everything in a jar or salad shaker. Shake vigorously until combined. Taste an adjust honey, salt and pepper. 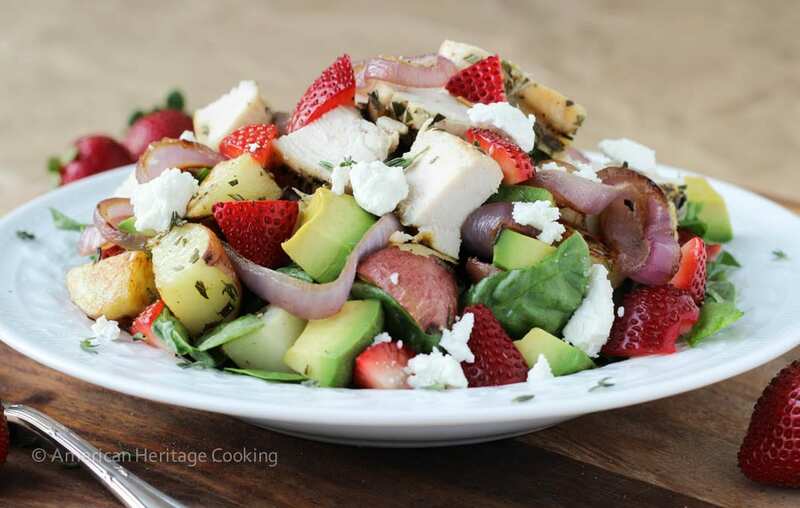 Because I know you like salad as much as I do!!! I’m thinking along those same lines Lelia. Looks so deliciously tempting! I’m eating a variation on it this evening too! I’ve made some tweaks because the same thing twice a day does eventually get old! I want this for lunch! Looks amazing. All my classmates have been begging me for months to bring them lunch too 🙂 You can make it in under 20 minutes…soooo easy, Lindsay! This looks wonderful. I’m so excited for a new homemade dressing. I’m a little tired of the ones I make. I make the same ones all the time because I don’t even measure any more! Oh geez, the price of these. They are just so good! 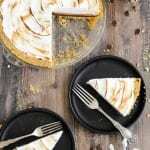 Thanks for an easy homemade version at home – my stomach and my wallet need it! Wow, Lindsey, this looks like a great recipe. I will try to replicate it this week when my daughter comes to town. Glad that culinary school is so rewarding. You ate this every day for a month? Well then, I’ve just got to try it! Not only does it sound full of flavor, it is so pretty! I did! I am guilty as charged, Kristine! Can’t wait to hear more about Culinary school!! Hope you are enjoying it! 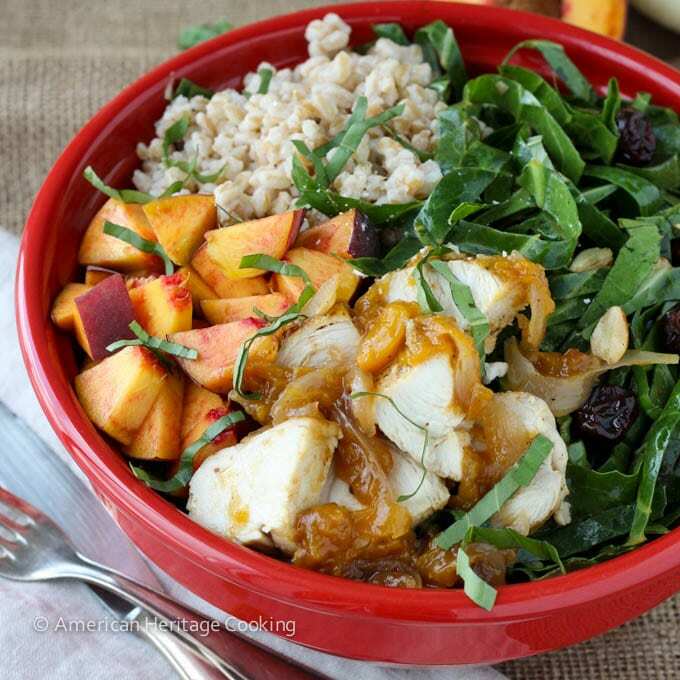 I LOVE quinoa bowls like this!!!! pinned!! I am definitely enjoying school and an update is (has been) in the works! Thanks for the pin, Alice!! Good idea with the chickpeas!!! Thanks! Sounds like a great salad. Love the colors as well. Will have to give it a try for my daughters, they eat salads pretty well. Thanks, Ella! You and your daughters will love it! Thanks, Kelly! The colors are the best part…well aside from the test! I am enjoying school but it has been crazy!!! What a yummy lunch! I think going to culinary school would be so fun!